Looking for a great place to stay outside of Ft. Smith near the 3-Mile Fishing Access on the famous Big Horn River' We have four quality cabins. 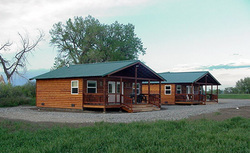 These duplex cabins are equipped with full kitchens and sleep up to four, 2 bunk beds, one in a separate room, dish TV and air conditioning. On the front deck you can relax and grill your steaks in a private setting. Directions: Absaraka Fishing Bear Lodge is located 3 miles north of Fort Smith, off the 3 mile fishing access road.